Proposed Plan of Improvements of Entrance 59th St. and Vth Av. C.P. This is a beautiful and unusual little map of the southeastern corner of New York City's Central Park by Kellogg and Pilat dating to 1871. It depicts the southeast corner of Central Park from the intersection of 58th street and 5th Avenue north and shows the planned improvements made to the southeast entrance, mainly to accommodate the park drives. It includes the clock tower, the then proposed monument that now sits in front of the former Plaza Hotel and Bergdorf Goodman. Also depicts the locations of trees, the ponds, and various walkways. A nice little map of one of the poshest part of Manhattan, Grand Army Plaza. Today, because of Vaux and Olmstead's efforts, New York Yorkers, ourselves included, have the privilege of enjoying what is, perhaps, the finest example of a planned urban public recreation area in the world. 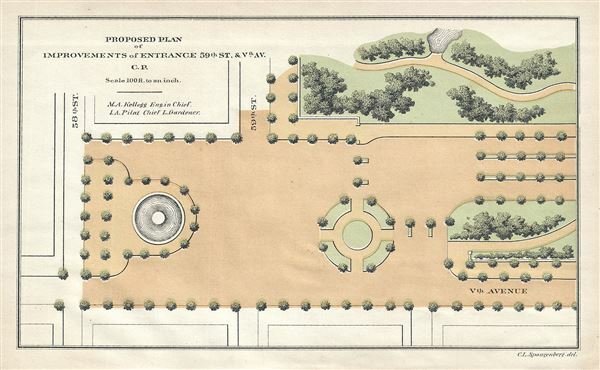 This plan was created by Parks Engineer in Chief M. A. Kellogg and Chief Landscape Gardener I. A. Pilat for the First Annual Report of the Board of Commissioners of the Department of Public Parks for the Year Ending May 1, 1871. Very good. Minor overall toning.